Western Angler's newest edition is full of great autumn fishing reading from around WA. 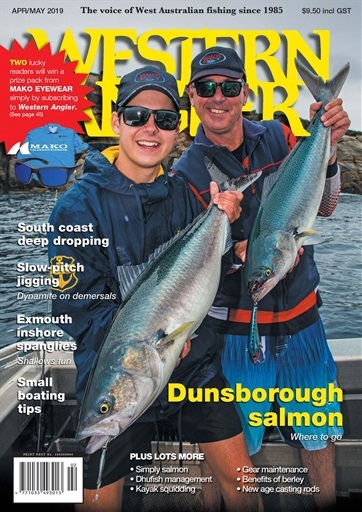 Autumn in WA means salmon and as the schools of these great sportfish move up the coast, that is the focus of the magazine, with two great features on this fishery and salmon on the cover. Young gun Max Sampson offer his tips for salmon fishing around Dunsborough, one of the most popular locations for chasing them each year. Adam Wright also has his thoughts on ways to target salmon, especially around Perth. It’s not all about salmon though and Damian Bowman talks anglers through the basics of slow-pitch jigging. Youngster Tyler Cooper has his first WAngler feature and it’s on the great little shallow water fishery for spangled emperor at Ningaloo. Morris Wilkinson looks at ways to take the stress out of small boat fishing, while Steve Hart takes the Western Angler project boat from Westerberg Marine for a spin to the Continental Shelf to do some south coast deep dropping. There's also a number of great columns. Peter Anderton sings the praised of modern casting rods, John Bormolini considers the Easter fishing options and Paul Tuckwell reveals why squidding is a great option for kayak anglers. Luke Chivers examined the benefits of trim tabs for boaters, Scott Coghlan considered the vexed issue of dhufish management and Tim Farnell discusses the value of berley. Jamie Chester also looks back at the controversy over crayfish management. We catch up on what's happening in the tournament bream scene with Shane Owens and Dale Sniffen has another great recipe. All subscribers go into the draw to win a fantastic prize pack from Mako Eyewear. Established in 1985, Western Angler is the benchmark for regional fishing magazines in Australia.